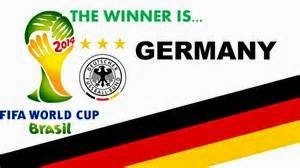 Congratulations to Germany winning the World Cup 1-0 in extra time against Argentina in the FIFA World Cup Finals. One had to feel sorry for the home town Brazil soccer ...oops, football fans, as you could see the pain in their faces: first from their 7-1 blowout loss they suffered to Germany in the semi-finals and then 3-0 loss to the Netherlands in the consolation match for 3rd place. But alas, it was not all a bad ending for Brazil and their fans. I didn't realize, like in the best [or worst] of college rivalries in the United States, where a fan almost gets as much pleasure from seeing their rival team lose as their own team winning, the same was true for Brazil fans in seeing Argentina lose. Argentina must really be a hated rivalry for Brazil as their fans showed an exuberant schadenfreude satisfaction in seeing Argentina losing a heart breaker in the finals. Check this out of Brazil fans rooting for Germany over Argentina even after their own team lost to them 7-1 in the semi-finals that knocked them out of a chance to win the World Cup. Love the respect brazilians showed for the team that knocked them out---- as I sports fan I know that sometimes rooting against your rival can be as intense and fun as rooting for your team!